The result last night was probably the best we could have hoped for. A draw doesn't allow Liverpool to leapfrog us into six place and reduces the gap between us and our north London neighbours to ten points. I'm sure that will be significantly reduced by the end of the season. It appears the manager has started his wooing of a summer transfer target already. 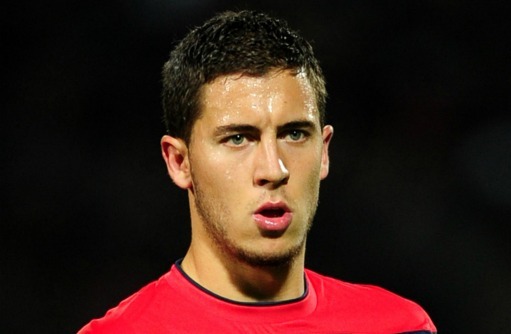 One who is sure to be one of our the queue marked highest priority: Eden Hazard. "I like Eden Hazard a lot, and for many reasons. "His creative ability, his talent for unbalancing opponents, his vision of the game, and his consummate skill in making the final pass all make him an in-demand player. Wenger has flirted publicly with the Belgium international for a while now. Hazard has also spoken of his affection for the way Arsenal play football and said in the not so distant past that it would be a dream to play in Wenger's team. Can a deal be struck this summer? It is going to be difficult and the price may prohibit Arsenal getting the player. All of Europe's elite clubs have been tracking the attacker. He's not an unknown talent and that's why there will be an auction. Lille stand to make a lot of money from his sale and that's one of the only areas where Wenger might be beaten to his man. I'm sure if it were down to Hazard, he would choose to sign for us. He's still young and has only had one season of Champions League football under his belt. And if he moved to north London this summer he'd be guaranteed a starting place. Do I think we've got a chance though? Not really. Had we signed him two seasons ago, we'd have had a clear run for his signature. This summer I think we don't have the money. The only way we'd have a chance is if we sold Theo Walcott and cleared out some of the players who have become surplus to requirements. That would allow us to generate enough cash to pay the £25m plus transfer fee Hazard would command and to pay him wages of more than £100,000 a week. We're certainly going to be generating some cash this summer from all the proposed overseas tours the media are being informed of. First it was Nigeria, now we're going to Seoul, Beijing and Hong Kong as well according to The Guardian. There can be no Emirates Cup this summer for the Olympics, so we'll be losing the cash generated by that two day tournament. But to me it does seem that the commercial team's proposal is taking things a bit two far. The manager wouldn't have a full squad to take with him because of the European Championships and the Olympics, so there won't be that many star names involved you wouldn't have thought. Then there is the problems caused by flying between three continents and doing all the promotional work. It seems the players could be suffering from fatigue before the season has already started. I can see the logic in having a pre-season tour in summers when there isn't a major football tournament. But to have one in a summer when there is not one but two tournaments seems madness. Anyway, I'm sure the Arsenal board would have consulted the manager and their motivations won't be purely led my the money we can generate. Fans in these parts of the world deserve the chance to watch their team close up and in person. I just don't think this summer is the right time to be trying to spread ourselves so thinly. One player who won't be taking part in any football until the start of next season is Emmanuel Frimpong who has ruptured the anterior cruciate ligament in his right knee. It's the same injury he suffered in his left knee in the summer of 2010, just as he looked set to break into the first team. He's set to have surgery in the coming days. And despite Arsene Wenger's claim that he's not thought about asking Theirry Henry to stay at the club past his initial loan spell, the player has said he'll be back to New York before the end of the month. "They have been really good about it, so I can't take advantage of them." It's a shame. But understandable. Let's hope he's still around at the end of the month when we play Spurs. So after three reboots this morning already, I hope this post finally sees the light of day... Whilst my laptop night be heading for a graveyard. Hopefully I'll be back tomorrow.